A Tom's Guide senior writer appeared on a recent episode of the "Random Trek" podcast to talk about an episode of "Star Trek: The Next Generation." Here's a quick news alert for all you "Star Trek" fans out there: Recently, we published an article by tech writer Marshall Honorof about his quest to watch every single "Star Trek" TV show and movie in existence. If you liked Marshall's article, you can now hear him talk more about the world of "Star Trek" on a recent episode of the "Random Trek" podcast. During each episode of "Random Trek," host Scott McNulty visits with a guest about a specific episode of "Star Trek." (The entire "Star Trek" TV catalogue is up for grabs, with the exception of "Star Trek: The Animated Series"). Guests are randomly assigned the episodes they will discuss, and are expected to watch the shows prior to recording the podcast. 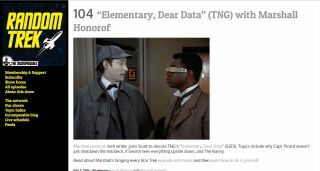 In episode 104 of "Random Trek," McNulty and Honorof discuss the episode "Elementary, Dear Data," from "Star Trek: The Next Generation." According to the podcast website, the two discussed topics that include "why Capt. Picard doesn't just shut down the holodeck, if Geordi sees everything upside down and [TV show] 'The Nanny.'"